As a native North Carolinian, and avid hunter/fisherman, I am always a bit skeptical of these new “farm-to-table” and “wild game” restaurants. I mean, unless you’re experimenting with molecular gastronomy, isn’t everything farm-to-table? Someone grew it right? And if you ever go to a restaurant that specializes in “wild game” and their menu isn’t dated, meaning it doesn’t change with the week, month, or season, leave immediately and remind them that deer hunting has a season, and you don’t like your venison frozen. Thankfully, when I sat down to interview Chef Aaron McCloud from Cedar DC for my Feasting Famously column, I not only found a Chef who was a really nice guy, but he believes in his product (which is remarkably fresh), but respects his craft and uses his skills to produce some painstakingly delicious food. Likely why Michelle ate there shortly after my interview with the Chef…um, because of the food, not my interview. Located just off Chinatown, it’s close enough to the Hill for lunch between meetings, and still accessible from downtown for a great dinner. The small, intimate dining room provides an ideal setting for discussing your latest contract between bites of wild boar. 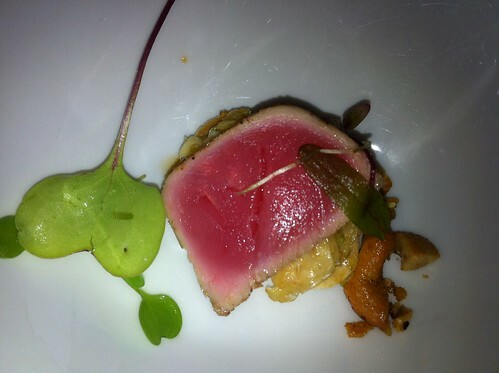 We started with this epic bite of seared tuna. It was amazing. Just look at it, don’t you want to eat that?! There were small bitter micro-leafy greens as well. To be 110% honest, there was so much food that I’m not sure exactly what was what and the wine made my notes all hard to read. Anyway, stop judging me. Back to food. 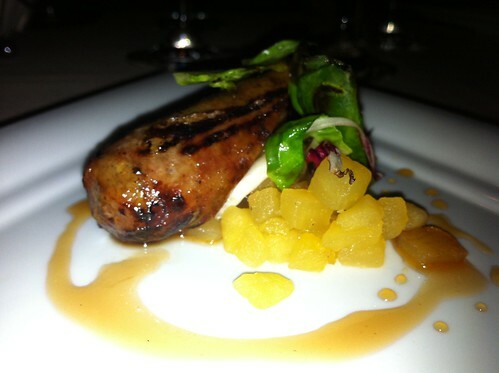 Then we had some of the best housemade sausage I’ve had in DC. It was rabbit and it was tender, perfectly seasoned, served with a small folded pasta that was locally made, and topped with some celery greens. Some Smoked Virginia Trout followed, with salmon roe, pickled onion, endive, preserved kafir lime emulsion. This made my knees weak. These plates might look busy, but everything perfectly balances. 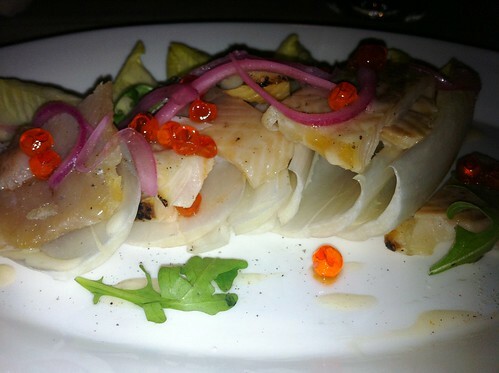 The crunchy bitter endive was a perfect textural contrast to the smokey soft fish. The salty roe and the bitter pickled onion were woven together with the bright punch of citrus from the lime emulsion. Everything just worked. This…this was strange. At least I thought it would be very strange. Lobster and White Chocolate Soup, with roasted baby vegetables. However I was very surprised that it was good. I shouldn’t have been however as lobster meat is very sweet, and so is chocolate, but the velvet-smooth while chocolate had a bitter coca undertone that balanced the entire dish. I slurped. More sausage! But with more things, and fruit even, so it’s healthier! The trick to sausage is, you need the snap, so the outside has to be cooked perfectly, and in original casing too. But you also don’t want it to be dry. So for lean meat like boar and rabbit, you have to add in fat, usually pork fat, but not too much to make it greasy or heavy. Chef Aaron – nailed it. 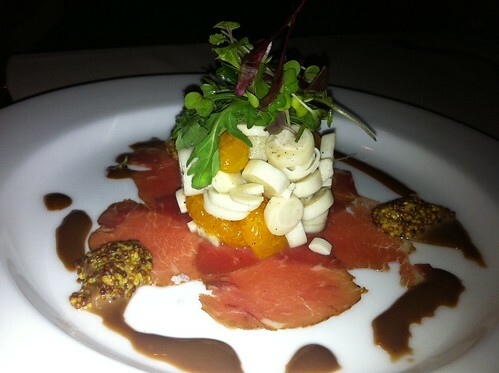 Next up, smoked Bison carpaccio with hearts of palm, tangerines, mustard grain. Delicate and earthy, the Bison was amazing. Personally, the tangerines didn’t do it for me, the meat wasn’t strong enough to need that sweet an offset – assume that was the thought, and if so, a good one. Course whatever number we were at by now, was a pan roasted duck breast consisting of roasted breast and confit rillettes, parsnip puree, seckel pear, cippolini onion. 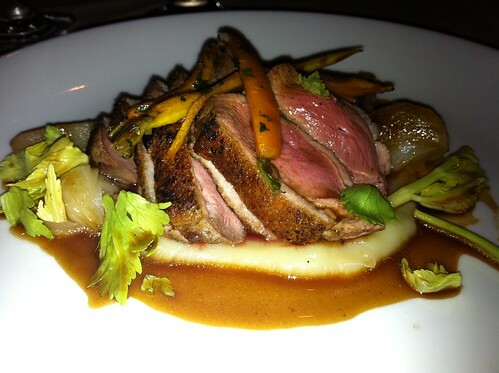 The duck was very tender, perfectly cooked, I just wish the skin was a tad crisper on the outside. 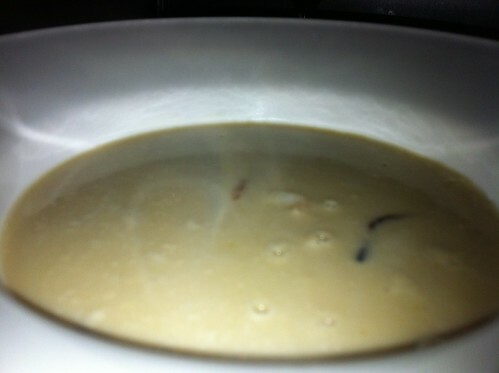 The sauce was amazing, as was the parsnip puree – potatoes would have been too heavy, this was perfect. More meat. 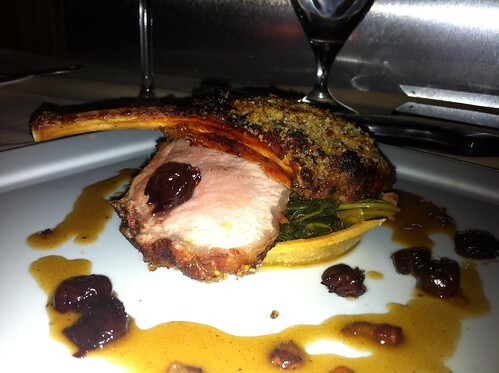 Next came braised Texas wild boar – a grilled loin chop, braised shoulder, greens, cherry compote, sweet potato tart, bacon vinaigrette. 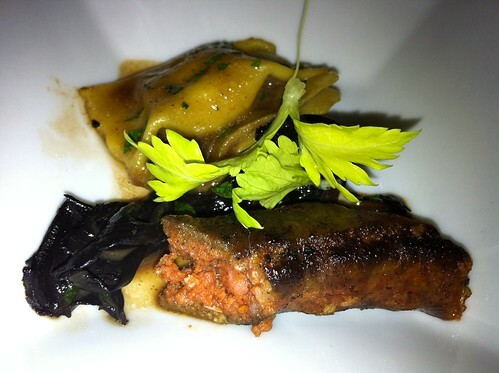 Boar is very lean, and this was not dry at all, cooked perfectly. The tart was a tad dry, and structurally it crumbled when you cut into the dish as a whole, but the boar was by far the star and it was perfect. 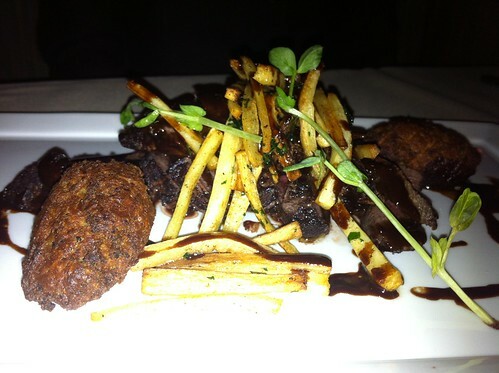 Also ordered, Mocha Cervena Venison including roasted garlic croquettes, parsnips, espresso jus. A very nice flavor combination, but not my preferred method of preparing venison. And finally, dessert, as if more food was needed. 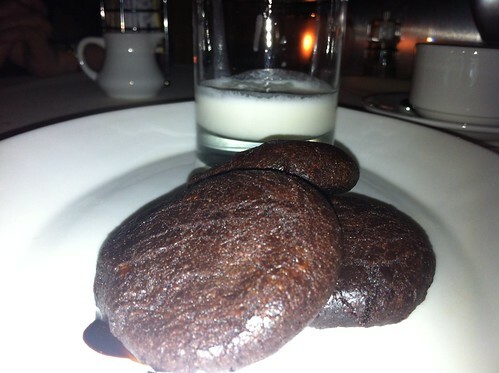 Soft chocolate cookies and almond milk.